What we have here are two machines that epitomize the sheer joy of motoring. Enough Said! At the outset, I’m afraid that I have to come clean – the Porsche Boxster / Cayman range of cars are among my favorite in the whole world. Nevertheless, I will do my utmost to remain objective. Well, as objective as one can possibly be when dealing with the likes of a Porsche Cayman S and Morgan 3 Wheeler – in this case the Superdry special edition. Lets start with the Porsche. When the original Boxster concept was first shown in the early 90’s, I really did think it looked precisely like what a modern day 550 Spyder ought to have been. Luckily, plenty of other people did as well. Thankfully, they were actually in a position to buy the car once it was launched – and, in doing so, rescue a company that was on the brink of virtual collapse a couple of decades ago. Then came the Cayenne, which grew Porsche into the most profitable carmaker in the world. But that’s another story. I’ve been fortunate to spend a fair amount of time with the original Boxster, and there’s no other car that I would choose for a blast through some twisty mountain roads on a beautiful day. Well, a Cayman perhaps! I recall the first time that I drove the Cayman in fact – or, specifically, the first time I took it around a corner. That event will be burned in my memory forever. I still remember being able to virtually visualize each tread block in the front tyres as they squirmed and fought for grip as the car began to push wide. All it took was a delicate lift to settle the front, before mashing the throttle once more as the Cayman dutifully tucked its nose in. Lets just say that there aren’t many cars out there that offer quite this level of feedback. A few years later this driving experience was bettered only by a Cayman R.
The Cayman R was a stripped out (well, in as much as it had racing buckets, and was missing a stereo) version of the previous generation model. Luckily, the Cayman R that I sampled – like the Cayman before it – had a manual gearbox, which, combined with its lowered suspension, provided the most involving driving experience that you can imagine. Again, the distinct memory of this drive involves a corner – which resulted in a quick shuffle in the footwell to heel-and-toe while downshifting before turning-in to keep the car fully composed and completely flat before exiting the corner at an obscene speed. The SportDesign steering was brimming with feedback, which provided sufficient reassurance to once again mash the throttle with confidence. Suffice to say, my co-passenger – devoid of the feel from the controls that I had at my disposal – didn’t appear quite as confident. His ashen face was a dead giveaway! 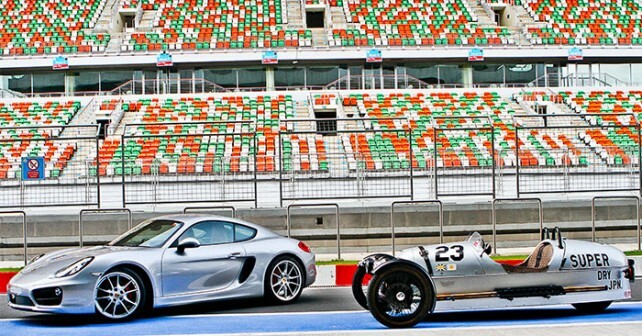 So, as you would imagine, there was a heavy burden of expectation as I jumped into the brand new Cayman S and headed out onto the Buddh International Circuit for the first time. In a car like this you get into the groove very quickly indeed. The controls are responsive, the chassis taught, and the power just right. The Cayman shares its mid-engined layout with the most advanced racing cars on the planet – F1 cars – not to mention the best supercars in the world, so it’s no surprise when the front end darts for the apex as you brake and turn in. Turn in a little too aggressively though, and the Cayman can bite. Now, you would never notice this on a public road – or, for that matter, on a racetrack with the traction control turned on. Turn off the traction control, however, and you do need to watch your corner entry speed – and, more importantly, the ferocity with which you turn in. Understand how the dynamics work, though, and you can use it to your advantage. Within a couple of laps, I was bringing the rear-end around on the brakes just enough to give me a clean line out of the corner – ensuring that I could get on the power nice and early. Exceed the limit on the throttle at the exit of the corner, and you reach a predictable, and safe, level of understeer – deliberately engineered into the setup by the Porsche boffins. Here again, after a few laps, you learn to use the weight distribution of the car, and the position of the engine, to help you get around corners as fast as possible. Once you’re in the groove, you can actually feel the weight of the engine right behind you shift to help you around the bend. Needless to say, it’s a pretty special experience! Problems? Well, the biggest one was specific to our test car. You see, it came fitted with Porsche’s 7-speed PDK gearbox. Now, transmissions themselves don’t come any more advanced than this one – it’s incredibly quick to shift, and smooth to boot. The problem is that Porsche offers these ridiculous buttons on the steering wheel to change gears – and I, for one, can never remember if I should pull, push, or, preferably, beat with a hammer to change gears. Of course, you can use the gear lever as well. But, better yet, be sure to option your Cayman with proper paddles if you actually want to play any part whatsoever in choosing the gear you’re in. If not, you could simply let the computers decide for you, which is what I did when setting a lap time. I urge you, however, to instead consider opting for an old fashioned manual gearbox. Cars like the Cayman are meant to involve you in the driving experience as much as possible, and nothing does that more than a clutch pedal and a proper gear lever. Well, hydraulic steering perhaps! Which brings me to the biggest point of contention with the latest generation of Porsches – the use of electric steering instead of hydraulic. And there’s a good reason for that – electric steering helps to make the car more fuel efficient since it doesn’t require a belt driven power steering pump running off the crankshaft. But a car like the Cayman is all about feel – the feel you get from the seat of your pants, the feel you get from the engine a few inches from your spine, and the feel you get from the steering brimming in your hands. And while Porsche has done everything it can to ensure that the chassis communicates fully with the driver, the steering just isn’t as good as it was before. It is lighter when driving in traffic, and it’s still as direct on the track, but it just isn’t as connected. I agree that, as electronic steerings go, it’s the best of the bunch – and I do expect it to get better with each generation, but I still lament the death of the hydraulic rack. Somehow, I didn’t feel its loss as much in the 911 – but that’s perhaps because the Cayman always felt more connected than even the mighty nine-one-one! At the end of the day, though, when you’re in the cabin of the Cayman you can’t help but be awestruck by the technology and precision of this machine. But, at the same time, this is a machine that allows the driver to play an integral part in transmitting its technology down to the road. You’re still very much a part of the machine, and that’s a crucial element in a sports car. This is a luxury sports car that you can actually drive everyday – then take it out for a memorable Sunday drive to keep you going for the week ahead. And that’s the beauty of cars like this – the engineering prowess aside, it’s how they make you feel that’s important. On that note, we switch from a car that’s typically over-engineered to one that’s – well – a little hard to define. The Morgan 3 Wheeler is, essentially, a laugh on three wheels. Yes, three! Two in front, which look as though they’ve been brought in via time machine from the 1920’s, and one at the rear that’s completely hidden from sight. It’s safe to say that the Morgan is like nothing you’ve ever driven before in your life – or, for that matter, ever set eyes on either. You could drive a Ferrari or Lamborghini on our roads, and you would likely have phone cameras being whipped out left, right, and center, but jump into the Morgan and you’re faced with dropped jaws and a look of complete bewilderment – people are too shocked even to work their cellphones. And, in this day and age, that’s really saying something! The Morgan 3 Wheeler is a ticket to instant celebrity the likes of which I’ve never experienced before. I now know what it feels like to be a Martian that’s just crashed landed his spacecraft on Earth – this Morgan, I’m sure, generates the same level of interest from bystanders. And that’s perhaps why Reliance Brands decided to bring this machine into the country. You see, they’ve been using it to promote the edgy Superdry brand – select stores of which have opened already. But they haven’t just added a few stickers to the Morgan 3 Wheeler, this is a proper special edition – of which 200 have been produced. The 3 Wheeler is, of course, where it all began for Morgan – which is the oldest car company in the world to be owned by a single family. The company was founded in 1910, but it’s 1937 that I’m interested in – because the Morgan Super Sports from that year bears a striking resemblance to the machine that we have here today. The Super Sports too had a V-Twin sitting in front of the bonnet, although this is a brand new 2.0 litre SS engine that produces 115 horsepower. Now that may not sound like much, but it’s enough to propel this concoction of aluminum and ash wood to 100km/h in just 4.5 seconds. You see, Morgans are made in much the same way today as they were a century ago. The aluminum body panels are hand beaten over polished wood. The truth is that wood is actually quite stiff, it ages well, and doesn’t react adversely with aluminum like steel. The end result is a machine that provides a driving experience that’s unfiltered and pure like nothing else on the road today. You step into the cabin, sit a few inches from the ground, wondering how to avoid getting run over, before thumbing the start button that awakens the V-Twin – at which point you think you’re astride a Harley instead. As you set off, you try and adjust your line of sight between the spokes of a rather large steering wheel, one of the two half-moon windshields, and a gap between the right front suspension and the engine. But it all falls into place as you come around the first corner. The single tyre at the rear can’t quite cope with the urgency of the power delivery at your disposal, and you find yourself power-sliding this bathtub on wheels. But it all happens so slowly and so progressively that you get the sense that this would be the perfect car in which to conduct power-oversteer lessons. But before we could do that, the Morgan decided to leave its mark on the track – by leaking oil that is. At this juncture, I should point out that the cap of the oil catch tank under the hood wasn’t properly closed so it wasn’t really any fault of the machine. But the good folks at the BIC weren’t having any of it, and the Morgan was banished to the parking lot. So, we couldn’t set a lap time in the Morgan, but that would have been irrelevant anyway. This is not a car in which to obsess over the numbers. This is a machine in which to enjoy the wind in your face, the mechanics of the suspension operating in front of your very eyes, and generally just making an exhibition of yourself. This is a happy car – it puts a smile on your face, and an equally wide one on every single person that sets eyes on it. And that’s a special trait, isn’t it? These two cars are amongst the most special machines made today – they are the very definition of the joy of motoring, albeit in completely different ways!